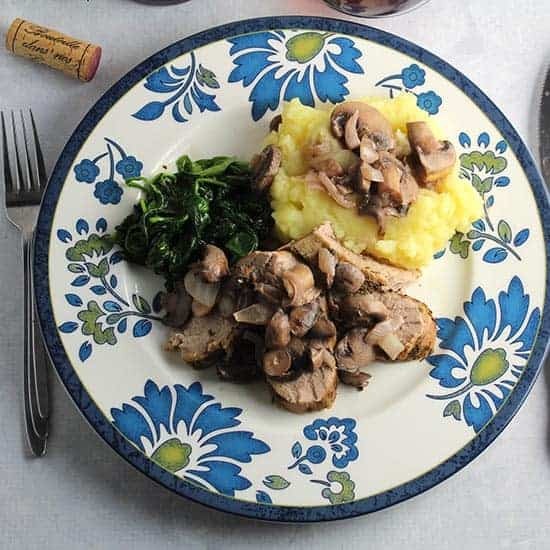 Pork Tenderloin with Mushrooms is a delicious meal that is a great choice if you’re in the mood for easy elegance! We enjoyed it paired with a Burgundy for Open That Bottle Night (OTBN), but you could serve it with other Pinot Noir of your choosing. Read on for the details of our OTBN observance, or click here to jump down to the recipe. Open That Bottle Night (OTBN) is a special annual occasion for wine lovers, held the fourth Saturday in February. It’s a night when we are urged to open a special bottle of wine that has been languishing too long in the cellar, waiting for a special occasion to be opened. OTBN becomes that occasion for many a good bottle of wine. Today the Wine Pairing Weekend blogging group is sharing our OTBN experiences. We are a group that always pays a good deal of attention to our food and wine pairings, but when opening a special bottle for OTBN, that focus on pairings is magnified. What food to make with that special bottle? I planned to open a bottle of red Burgundy that I tried at a wine club dinner two years ago. We tasted quite a few good wines that night, and my OTBN bottle was my favorite from the lineup. This bottle was very good when I tasted it originally, but it seemed like it would get even better with some time in the cellar. But two years seemed like long enough, and OTBN was a good excuse to open it. Before we get further into discussing the wine, let’s talk about our food pairing for the Burgundy. I thought about making Beef Bourguignon, but realized I wasn’t going to have quite enough time for that on OTBN. Salmon with a mushroom sauce would be a nice pairing for a Burgundy, but I’ve already served up that combo enough here on Cooking Chat. 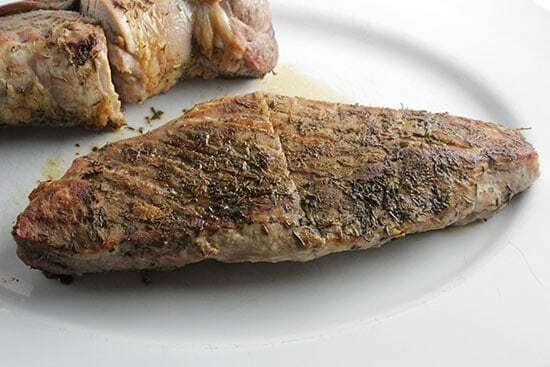 How about pork tenderloin with mushrooms? This pork tenderloin idea had promise. 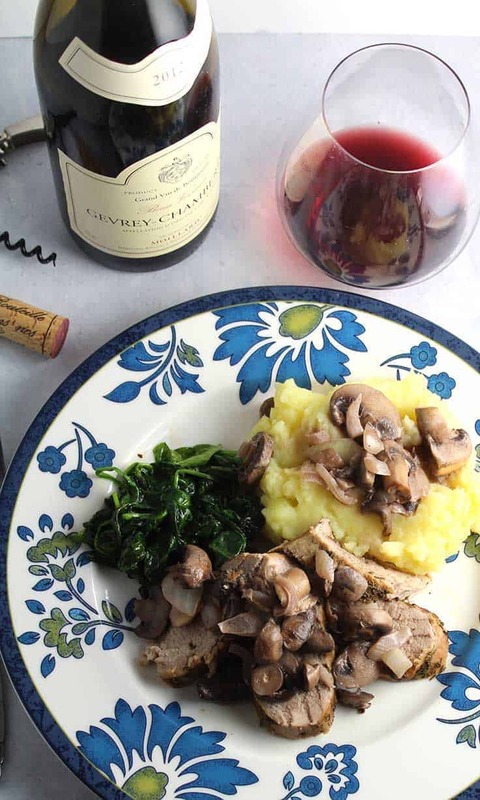 Pork and Pinot Noir can work well together, and mushrooms improve the match. So I put together a simple Pork Tenderloin with Mushrooms recipe for our OTBN meal, and was very pleased with the results. The rub I made with thyme and garlic powder sealed in the juices nicely, and the meat was tender like you’d expect given the name of the dish. The mushroom cream sauce adds some elegance to the dish, and it all came together nicely on the plate. I’ll definitely be making this again soon! We rounded out the meal with some mashed potatoes and sautéed spinach. OK, time to get back to that wine. So the red Burgundy that was waiting in the wings for this occasion was the 2012 Moillard Gevrey-Chambertin Beau-Versant (13% ABV). The bottle is in the $60 range. 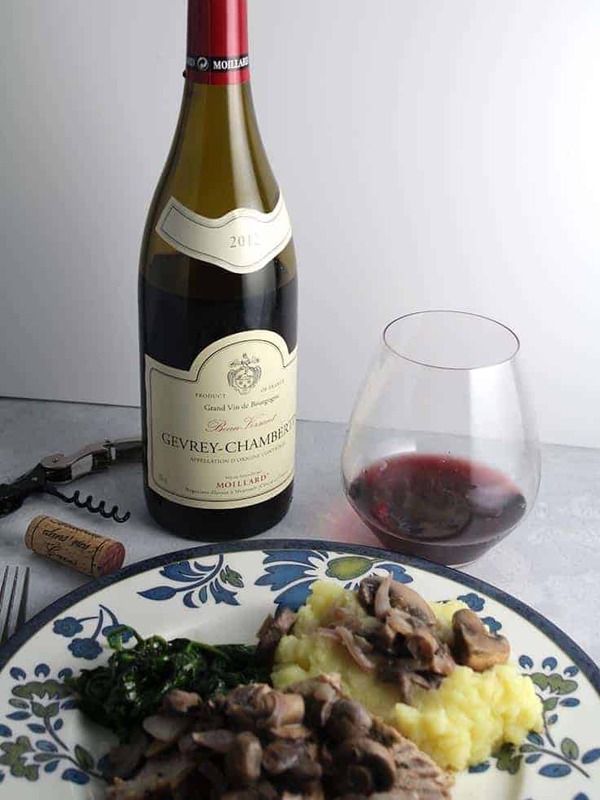 Gevrey-Chambertin is a village in the Côte de Nuits wine making region of Burgundy. This Burgundy is 100% Pinot Noir, and is brick red in the glass. I got lilacs on the nose, and licorice was the first thing I tasted. Bright acidity, cherry fruit with vanilla notes. Smooth mouthfeel and a lingering finish. The cherry fruit went nicely with our pork, and the smoothness of the wine was good with the mushroom sauce. I’d say pork tenderloin was definitely a good pairing for this Burgundy. As much as I liked this pairing, I have to say my assessment of this bottle may have suffered from the buildup. It is certainly a very fine bottle, but intentionally putting something down for a couple years and open it for OTBN definitely raises expectations that the wine will be something amazing. It was very good, and paired well with our food, but I’ve enjoyed other bottles just as much with recent meals. My conclusion: this was a good pairing, but I think I’ll come back and make this pork tenderloin again and pair it with a simple Pinot I pick up at the shop that day. And the next nice bottle of Burgundy I buy might not last two years in the cellar! I used two tenderloins for this recipe, which is a good amount for 6 or 7 people, or if you want leftovers. You can easily make 1 tenderloin and half the rest of the recipe for a smaller group. 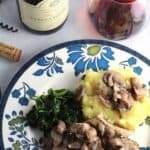 Juicy roasted pork tenderloin topped with an easy and delicious mushroom sauce makes an elegant meal, especially paired with a red Burgundy. Make the rub: combine the garlic powder, tablespoon of dried thyme, salt and sage in a small bowl. Preheat the oven to 400 on the convection setting, if you have that option, or 425 conventional if you do not. Lay the pork tenderloin out on a work surface, and spread the rub over the pork. Rub it into the meat, and let sit for about 15 minutes at room temperature. Place the pork into a roasting pan, and put in the preheated oven. Make the mushroom sauce as the pork roasts, which takes about 20 minutes. Heat the olive oil in a skillet on medium heat then add the onions. Cook for about 5 minutes until they begin to soften. Add the mushrooms, and cook for 5 minutes or so, until the mushrooms begin to sweat. Add the red wine and the 1/2 tsp of thyme. Simmer until the wine is mostly absorbed, about 5 more minutes. Stir in the cream to finish the mushroom sauce, and add salt and pepper to taste. When the cream starts to bubble, lower the sauce pan to very low, to keep warm for the pork. The pork should take about 20 minutes to roast to doneness, though you should check it a few minutes before hand to avoid over cooking. Pork tenderloin should still have a little pink showing, registering between 140 and 145 degrees when you remove it from the oven. Set aside to rest for about 5 minutes. Slice the pork, and serve topped with the mushroom cream sauce. Enjoy! 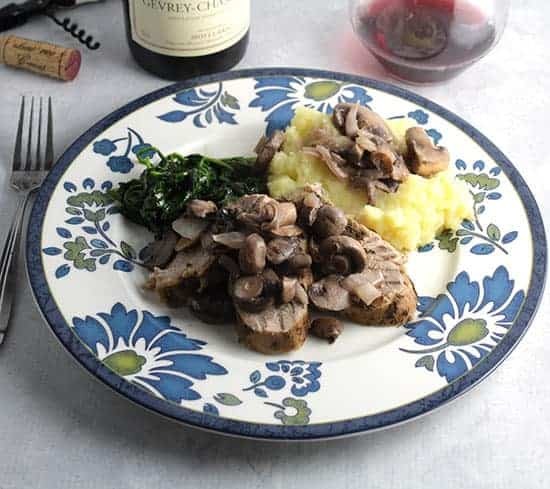 Cooking Chat posted “Pork Tenderloin with Mushrooms and a Burgundy” You are here! You can never go wrong with a Burgundy! Great pairing. What a wonderful pairing! Thanks for the encouragement to participate in OTBN this year! Thanks Sarah! I liked yours a lot, too. Looks like a classic and beautiful pairing. Wow, I serious food and wine envy! What a lovely pairing. I agree with you, mushrooms usually enhance the flavors of Pinot. Almost like they were “born” to be together. I can see where a wine might be like a movie that is overly hyped and it’s more likely to disappoint. But in the end good and and good wine with the people we care about is always a winner in my book! Cheers David! I definitely enjoyed the wine and pairing more than an overhyped movie! It can be a little disappointing, finally opening that cellared bottle. Sometimes those spur of the moment pours come off better without the pressure of anticipation. Glad it was a good pairing though and thanks for hosting. If you like that old world Burgundian flavor – grab 2011s from Willamette Valley if you find any. Thanks for the tip, Jade! I do like Willamette Valley Pinot generally speaking. Anything with mushrooms = Great. Mushrooms + Burgundy = Greater!! Lovely. Cheers!! Thanks, we enjoyed the combo! The pork…the ‘schrooms…the greens…the wine…invite me over! We should relocate all of our food blogger friends to one city for great reciprocal dinner parties! This looks so good, I love the pairing with the burgundy! it worked well together for sure!